Re-invigorated by the cooler start to the day after the heat wave of late, Fiona, Jodi, Kamil and I keenly arrived at the plot first, to set up ready to welcome volunteers or visitors, there has been a steady flow of new faces and regular visitors this year and pleasingly today’s session followed this trend. Kamil begins laying the weed suppressing fabric around plot borders. A very welcome addition. Hellen getting to the roots of things. We were very happy to welcome four plot first timers (or first time I’ve seen them! ), Councilor for Kursaal ward, Hellen Mcdonald, partner Jim, their friends Hellen and Aisha. A more frequent visitor the plot recently Jason, a poetry collective member joined us just in time for Lunch, always great to hear Jason waxing lyrical on hot topics of mutual interest. Jim and I taking a step back to assess the progress. Jim passes the saw as fit for purpose. Is that Jason we spy through the new roof structure? Nella ensures the play aspect is observed with her fine balancing practice. The work party helped turning over the raised beds to a fine tilth, as Jim says if the large clods are left to get sun baked they turn into brick hard. I appreciated Jims collaboration to help with the next stage of the potting / tool storage structure build, namely creating the framework to support the roof sheets, these will also collect more rain water. Jodi is getting quite the expert lawn carer. Aisha and Hellen removed loads of weeds . Kamil’s latest aquisition for the plot, good pots for creating cuttings and sharing plants. Must be nearly lunch time? On a recent trip to Edinburgh we visited my Uncle who had kindly prepared dozens of cuttings from his beautiful ornamental, herbaceous garden. Adding more diversity of plants to the plot not only looks pleasing but should encourage more varieties of insects and wildlife, a better balance means a healthier garden. Another scottish plant as yet to accurately identified. Such a hive of activity on the plot this time so much so we were all so ravenous come lunch time we even forgot to photo the wonderful feast , how sinful! Alitja’s meditereanean gluten free pea pasta bake, some fresh toms from the plot, yum and to keep up the standards fiona had baked superb vegan chocolate brownies. Re-energized we finished the day’s session by giving the plot a good drink before we went on our merry ways. We arrived on the plot with a busy schedule in mind. Duncan and Fiona were hard at work keeping the weeds under control who seem to be encroaching from each side of our remote plot. Oh yes, community allotment is not only glamour you see:). We had a discussion with Duncan on the pros and cons of a grass path vs a mulched path. Not sure we got that settled. What’s your preference and why? Soon enough two visitors arrived and put themselves to the task of gathering black berries – free food forever!. W have not put one ounce of work towards the brambles and they still produced lots of lovely berries for us. Even more visitors arrived and after a short chat and tea threw themselves into planting our two apples trees. They will need plenty of watering in the coming weeks but we could not wait anymore as the pots were more likely to dry out then if we put them in the soil. Then came the turn for some composting – we filled the bins with garden green waste, covered with some used coffee grounds and watered them. Last Taster Day’s bins seem to be doing well with the materials slowly moving slower. I’d like to start up making somecomfrey tea to fertilize the beds but also as I found that the remaining sludge is a great compost activator so we could use it in the bins. We took part in the http://www.bigbutterflycount.org/ and spent 15 min walking the allotments spotting butterflies. Some of us went old school and had print outs and some downloaded the app for the phone. No one felt an expert in recognizing butterflies but the materials were quite self explanatory and soon we were marking off first findings. In all honesty I don’t have much appreciation for the white butterflies especially after they found a hole in our brassica bed netting and their offspring devoured the plants but thinking of them as performing an important pollinator function helped me appreciate that nature is about relationships and that sometimes we get and sometimes we give. All in all we counted 26 butterflies and around 5-6 varieties (ie. large and small white, gatekeeper) as some of them were not willing to perch down for us to allow more accurate inspection. Following a scrumptious lunch we set off on to the green for the Tamalpa workshop with Donna who kindly offered it to us prior to her trip to the states. We walked, we moved and swayed and sat and drew about our experiences. It felt great to connect in this way with our bodyscape in nature and hear from everyone about their experiences. It reminded me of the different ways of observing activity I tried during the Permaculture Design Course and how it helped me and others see our surroundings with new eyes and get fresh insights. That’s it for now and see you on the 27/08 for the next Taster Day. Hello stewards of the fertile soil! Last few weeks I got wind of source of coffee grounds, use for your own plot, compost heap or gather for community plot to have big yields and reduce wast. 3. McDonald’s at Garon’s roundabout, if the young person at the till does not know what you are asking about ask team leader. Very forthcoming and can get loads. Should work the same in other establishments. Avoid lunch times and when you see 10 cars queuing up the drive thru. Add other places in the comments below. With the sun blazing down, people who were discovering the plot or the first time began to arrive laden with cakes and poetry books. The table had been set out by Fiona with her delicious falafel, salad and tea and the plot welcomed us into her arms. A strong Green Party contingency arrived with Simon and Sue, Jason, Fiona and myself. We were also joined by two of the Lady Garden Poets Rachael and Susan. Haley and Jason also brought poetry to share. Sally Ann, Susan and Fiona had been hard at work weeding the beds, and clearing the way to dig up the potatoes which were finished flowering. However, Cake, poetry and the ever-growing group of guests was calling. As unusual the food was delicious and there was ample for everyone, topped off with Lavender and Blackberry fairy cakes and Rhubarb crumble cake, all made with produce from the plot, we settled down to listen to the poets. The setting couldn’t have been better for poetry, the air was super still, and the surrounding nature provided a wonderful amphitheatre capturing the voices, the laughter and the applause, and keeping the feeling close and intimate. We were encapsulated first of all by a very apt poem by Susan called “The Allotment”, a bittersweet look at the cycle of life as seen through the eyes of the gardener on the allotment. Then we were blown away by the performance piece by Jason and two lovely poems by Hayley and one by Rachael. A lull in the poems brought out poems from the floor from Simon, Jude and …. Er…. Me! As I spoke my poem I was aware that there were more than humans in the audience… that the plants and trees on the plot were relishing our words, the birds engaged with the gestures of Jason’s poem about Orpheus and the sun and clouds even engaged with our words, providing light and shade to our storytelling. 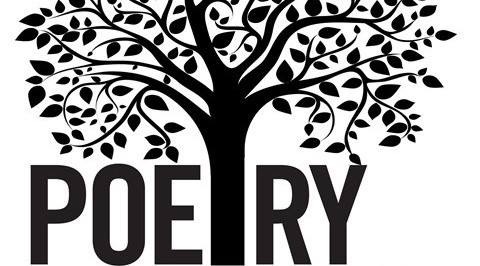 Altogether the poetry on the plot event was a lovely day, very relaxed and inspiring, and we all went away with a feeling of fulfilment and joy, that something truly amazing had occurred and that we had planted our roots just that little bit deeper into our community.